The Center for Applied Game Research (CEAGAR) at Aalborg University aims to promote interdisciplinary applied game research across a variety of research fields by connecting AAU researchers working with the development, use and evaluation of games. CEAGAR aims toward challenges, which concerns real-world problems addressed through games as well as innovation in game design and development within the gaming industry. The center is an interdisciplinary cross campus hub and currently involves participation from 40+ AAU researchers from various departments such as the Department of Architecture, Design and Media Technology, the Department of Communication and Psychology, and the Department of Learning and Philosophy. CEAGAR also collaborates with other international game researchers and game research centers. The center facilitates a physical Game Lab at AAU in Copenhagen. 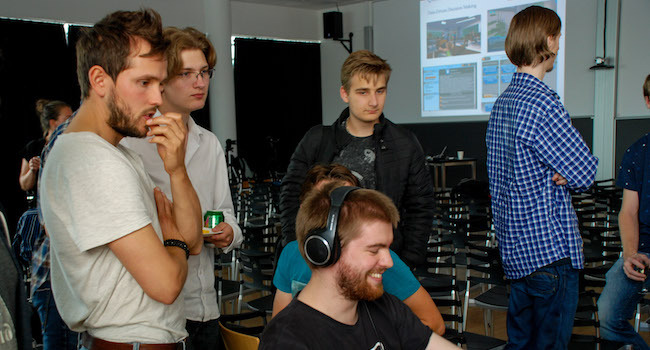 The Center for Applied Game Research (CEAGAR) at Aalborg University aims to promote interdisciplinary applied game research across a variety of research fields by connecting AAU researchers working with the use and development of games. The center focuses on applied research and is aimed toward challenges, which concerns real-world problems addressed through games as well as innovation in game design and development within the gaming industry. A key focus is on developing principles for the use of games through studies on purposeful gaming experiences that can be used to address challenges in a variety of fields such as e.g. education, conflict resolution or health. The center currently involves participation from 40+ researchers from the Department of Architecture, Design and Media Technology, the Department of Communication and Psychology, and the Department of Learning and Philosophy. In this way, CEAGAR aims to become one of the world’s leading interdisciplinary hubs on applied game research. The center is in close contact with other international game research centers, the game industry and a diversity of users of games through both established game companies and start-ups as well as a number of public institutions such as schools, teacher colleges and activity centers. These strong connections promote the exchange of ideas, giving researchers a contemporary perspective as well as user/player and business insights. Games, play and learning has become the focus of more and more academic researchers in recent years, both nationally and internationally. Games are no longer tied to the traditional screen/keyboard or TV console/controller-based ways to play, but may depend on extensive use of the player’s body as seen in the use of technologies such as motion tracking and touch computing. Digital games are available in many different technology platforms where mobile technologies have enabled such formats as location-based outdoor games and games involving for example augmented reality. Digital games are also embodied in frisky and playful art and in other areas across different aesthetic formats. Gaming and playing permeates almost every aspect of life including institutions and at the workplace. The growing cultural interest in games has lead to an increasing application of games and game dynamics (gamification) within both formal and informal learning contexts. In addition, digital games have become a very large industry, and many game companies have established themselves in Copenhagen. The game industry also has a strong presence in the North Jutland region where many companies have their base in Aalborg. More and more academic disciplines show interest and are harvesting knowledge from working with practice and theory on digital games. Games are no longer a product reserved for designers and developers, but is an interactive format that points to new ways of relating to learning and human experience. Digital games can be seen as expression of a multidisciplinary manifest in the academic approaches, where interdisciplinarity is paramount. The implications relating to both the physical and academic design in conjunction with the interest in the aesthetic and experiential aspects are the basis for continued development of digital games, which basically requires multidisciplinarity and pointing toward an integration of natural scientific/technical and humanistic/communication scientific methods – both in terms of practice and theory. The center is an interdisciplinary cross campus hub and includes a physical Game Center as well as the already established Game Lab at AAU in Copenhagen. A central part of the center’s activities is to build prototypes of digital games for research purposes as well as for testing and demonstration of ideas for games, game analytics, game development and game experiences. Through close integration of students’ game projects, the center facilitates strong relations between research and teaching. The center activities so far has involved a number of research seminars, exchange and collaboration with international researchers working with applied game research, the establishment of NORDGOLD (NORDic research network on Game-Oriented Learning Designs), an international PhD course held by members of NORDGOLD, and the funding of a number of both smaller and larger research projects. Seminar Rows: representations of the participants’ recent research results or studied international results. Workshops where open issues / ideas are presented and discussed. Academic meetings of scientists, customers and game industry (including discussion of game ideas, etc.). Thesis and term projects in graduate programs. Associated postdocs / PhD’s full-time residence for at least six months. Visiting researcher office space of shorter duration. Invited guest professors of shorter duration. The funding of the center activities will be generated through support from various foundations, industry partners, and through externally funded projects. There are thus on-going efforts to establish research projects as well as cooperations with sponsors, the gaming industry and project partners in various domains. The center will furthermore be an inspiration and support for the development of new and toning of existing graduate programs, which involve the development, design and use of digital games. The center thus supports research-based programs in order to provide bachelors at AAU an exciting offer as a candidate superstructure by bringing together students from different bachelors on the candidate or to establish a framework for cooperation (e.g. through production-oriented semester projects) between existing graduate programs in the field. The collaboration between the University’s game researchers will give the opportunity to offer more electives and thus give graduate students the possibility to create an individual profile – e.g. focusing on preparing their skills aimed at the demands of the industry. The center has a board consisting of representatives (researchers) of the departments participating in the center cooperation. The coordination of the center activities is organized by three Co-Directors, Henrik Schønau Fog, Lars Reng, Thorkild Hanghøj, and Anders Drachen who are all actively involved in various areas of applied game research across departments at AAU. 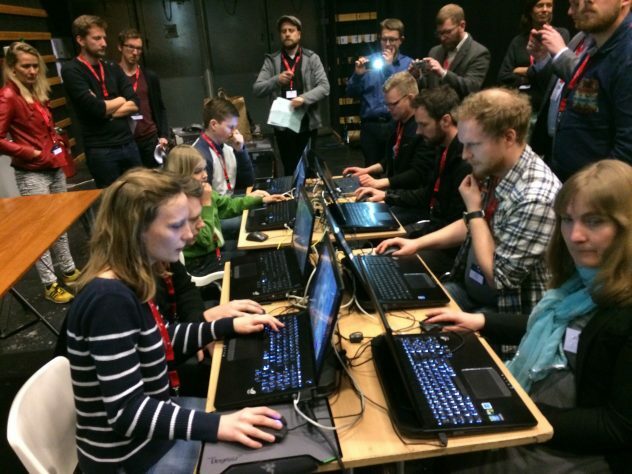 The center is officially established during an opening reception on September 23, 2015, together with the launch of the center website: Game.aau.dk.